A little over a week ago I went to a baby shower for a friend. I got the cute baby basics (can we say yellow striped summer dress with blue/white polka dot edging and bloomers!? ), but I also wanted to make something for the mother-to-be. Mostly because she had told me that she wasn't really sure that she was going to decorate much. I got to work thinking up ideas for some sort of room decoration that can be easily moved and matched the bedding. I had been wanting to do some sort of wall art that incorporated the use of paper punches. This desire was pushed into the "must do it" when I came across a very very similar idea at Target. Part of the Fanciful Collection, this guy is in a all glass shadow box that you can see all the way through. There is also a smaller one as well. While they are cute, I definitely wanted to make something myself. So off I went to gather all of the tools I needed. Lucky me I had everything I needed (who says stock piling doesn't pay off!?). I gathered papers in the colors of the bedding in all different patterns and shades. I then picked through the paper, picking the ones I thought would work best. I ended up using all of the same linen textured papers (minus the green with purple print). I already had the butterfly punches and glass shadow box. Fun fact...see that "awesome" family picture on the one pane of glass!? Yes? Well it's pretty much hermetically sealed onto that very very very very thin piece of glass. It may never actually come off of the glass...ever. I mean who the heck does that!? I get that it's there to give you ideas...but to glue it on so much that it won't come off easily is asinine! Lucky for me I had a second IDENTICAL shadowbox. Now when I say identical, I mean I bought it at the same time, from the same place, the same company made it and it was the same exact size. So the glass should fit right!? RIGHT!? 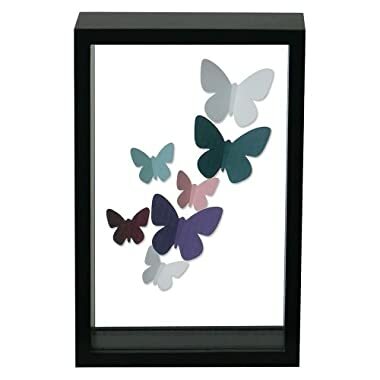 After I sat there placing every butterfly and then re-placing them with glue dots onto the pane of glass, I went to place the glass into the frame. It didn't fit. Yeah I probably should have checked that, but silly me thought that glass from two identical frames would be interchangeable. Yeah right. So something that should have been one of my easier to do crafts just found a way to be very very difficult. I may have freaked out a lot. I just perfectly placed every butterfly on glass. Very very thin glass. After I finished cussing like a drunken sailor, I went upstairs to go to bed and cool off. My husband stayed up and sanded an edge of the glass down so that it would fit into the frame. I think he really loves me or something. That and he probably wanted me to not wake up pissed in the morning. In fact, the next morning I only cussed lightly about the fact that it was dumb that there was that much of a difference, but it passed quickly. I cleaned up the glass and didn't cut myself...which probably would have sent me off into another tizzy and got everything wrapped up. The wrapping incorporated the colors yet again and used up the last of the green/purple paper. I actually didn't make the topper (shocking I know). I got that from Anthropologie a few years back, because they give out awesome holiday wrapping stuff...when you buy something of course. And because I was feeling better about the frame fiasco, I made a matching card! Minus the setback, I was so happy with the way the frame came out! I love it so much that I think I am going to have to make something similar for somewhere in our house. I may not do butterflies, but I want to do something! I may be buying a different shadowbox though.